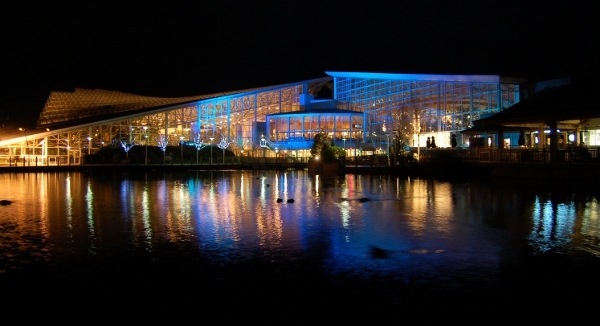 During 2008 we went to Whinfell Forest Center Parcs in the Lake District. This is the holiday village formally known as Oasis, before it was bought by Center Parcs. 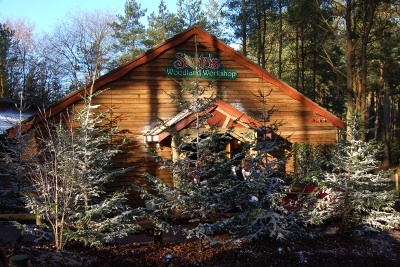 The Christmas special holidays for Center Parcs are referred to as Countdown to Christmas, but the Whinfell forest was referred to as a Winter Wonderland Lapland Experience. The holiday was up to the standards of the other Center Parcs, but I was expecting something a bit more as it had been advertised as their premiere Christmas Holiday. The only things that distinguished this from the other parks was a sign “Welcome to Lapland”, a few “workshops” near Santa’s Grotto and two reindeer. These were all nice, but the Christmas holidays at the other parks are just as good. Being in the Lake District this is the location more likely to have snow. In fact the week before we went there had been lots of snow and a few snowmen were just about still remaining. On the negative side it was very cold, in fact it was very, very cold! As we wrapped up in plenty of clothes this was most noticeable when cycling around the site. I’ve already said what I think about Center Parcs in general (Search for Center Parcs related posts), so I won’t go into too much details, except to say that baby facilities throughout the site were all excellent and it was very baby friendly in general. Restaurants were good and most of the ones had microwaves and complimentary baby food (except the Italian restaurant where we had to warm our own bottle and baby food using a jug of water). Here are a run-down of some of the unique aspects of this holiday. This is the first time we have used bikes with a baby. We hired a bike with buggy which was very good. We took our older childs bike with us (age 3), but although she is quite good on the bike at home due to the hilly terrain it was not quite so good for her to cycle around and she was not good enough with her brakes to allow her to cycle without someone running alongside her. The buggy did work well though. The buggy was very light with only a baby in, but it made the uphills hard work with both children in. If you are able to get a villa that is not too far out you are better off with pushchairs, otherwise the buggy was very good. 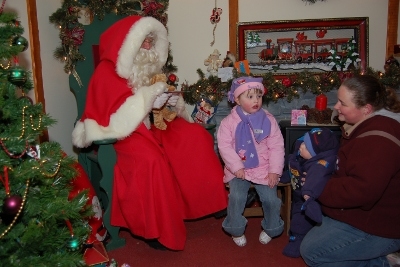 The visit to Santa was great, with plenty of time to spend with him to talk about presents etc. The included photo was quite good for that type of setup. Presents were soft toys, but they were quite good quality. It felt like money well spent. 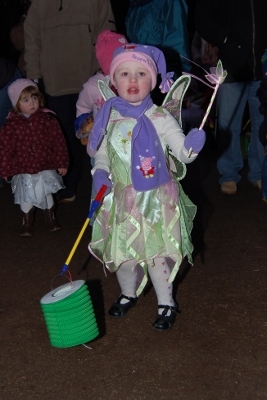 One unique feature of the Winfell holiday was the Magician and Fairy procession which was held at nightfall. We walked from Santas Workshop through the park to the centre where there was a Christmas Fair on. It was very cold for the procession and there were a lot of people there so only a few could walk with the main characters, but some of them did stop to wave at the passing children. We went to the Teddy Bear Picnic featuring Rupert Bear. The room was very small compared to when we visited at Elvedon Forest, but it was still enjoyable. 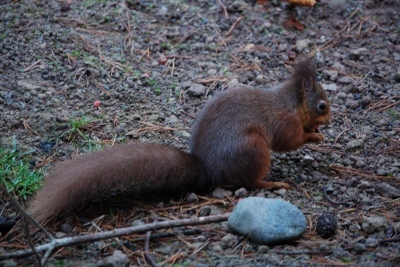 One of the things I liked as well as the children, was to see the Red Squirrel up close. I had not really seen any when I had visited Winfell forest before as we have always stayed at the apartments, but this time in one of the lodges we had a squirrel that would come to the back of our lodge each morning and one that came around the front which we only saw on a couple of occasions. Finally the quality of the accommodation was exceptional. We stayed in one of the new Woodland Lodges. We normally stayed in the comfort / comfort plus villas, but when booking we were offered a 2 bedroom Woodland Lodge for the same price as the 3 bedroom Comfort Plus Villas. The new lodge was in excellent condition with colourful furnishings and a TV in the main bedroom as well TV and DVD in the living area. There was a dishwasher included, but it didn’t fit the plates, which kind of defeated the point, but it could be used for some items. The black board in the dining area was good fun, and we created a different seasonal picture each day. We had another good holiday at Center Parcs although it was very cold. The only real issue being that the park was only as good as the rest whereas we expected something a bit better, but it is still well ahead of any other self-catering UK holiday park we have visited. If booking on-line and going with young children remember to include the promotional code of FAMILY unless you have a promotional code with a better discount (e.g. loyalty offers / special offers). I think you can get 10% off using FAMILY as the promotional code, although there are sometimes better promotions available online or in baby magazines etc. This entry was posted on Wednesday, January 28th, 2009 and is filed under Babies, Children, Holiday, Tourism. You can follow any responses to this entry through the RSS 2.0 feed. Both comments and pings are currently closed.